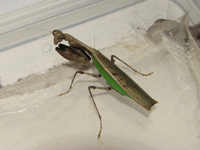 Acromantis are small mantids with a slight body. The adult females subwinds are larger than the upper wings, which leads to a interesting look. At present, at least 21 species are described, e.g. : Acromantis formosana (SHIRAKI, 1911), A. grandis (BEIER, 1930) and A. japonica (WESTWOOD, 1889).